A school bus drop off students in Nashville, Tenn., where the city's school district has experienced one of the worst shortages of drivers in the country. Being short-staffed on routes is stressful as drivers scramble to try to cover for each other. Earlier this year, for example, one Nashville high school's 10 routes had no dedicated drivers. Veteran driver Suzanne Adams says she was running back-to-back routes to make sure the students got picked up. "You should be doing three routes in the morning and three in the afternoon," she says. "I was doing 6 1/2 in the morning and six in the afternoon." Kids were left waiting for an hour or more and showing up to class after the bell rang. Sophomore Souleen Ramazan, who rides on Adams' bus, says she understands. "It is a hard job. You have to wake up extra early in the morning. It's hard for them, too," she says. For many, the hard part isn't the early mornings; it's the unpaid time off. There's spring break, fall break, winter break, not to mention summer. It requires disciplined budgeting, even for someone like Adams who has topped out on the hourly pay scale. "When the kids are out of school, we don't get paid. That's really hard, so I do understand people going somewhere else," Adams says. Tracy Garton has been a Nashville school bus driver for a decade. "I've said like every year that I'm going to quit and look for something else," he says. It's not the kids that keep him coming back. In the past week, he's caught one student smoking marijuana, and another threw a bottle out the window and broke a windshield. "You gotta sit with the police and go through all that. It's just stressful, you know. It's not just like a regular job where you go in, work and go home," he says. And there are many other regular jobs out there right now. They can make more driving charter buses or 18-wheelers, and the trucking industry has an even more pressing driver shortage, so sometimes there is a signing bonus. Like other desperate districts, Nashville's public schools have raised pay and offered bonuses. Administrators admit they failed to keep pace during the economic recovery, especially since bus drivers bore some of the budget cuts during the recession. "An ancillary service like transportation can be one of the first places a school district looks to make cuts," says Tom McMahon, editor of a trade publication called School Bus Fleet. He surveys districts every year on staffing levels. There's a direct correlation: When unemployment is high, districts have very little trouble finding drivers. But low unemployment spawns an exodus. "School bus drivers in many cases just aren't paid enough for the amount of responsibility they have," he says. Nashville's shortage has gotten the attention of some brave job seekers, and recently, a new batch of drivers was learning how to back a 45-foot-long vehicle. The school system is paying new drivers, like Roman Steele, while they study to get their commercial licenses. "Pretty much I thought it'd be a cool opportunity. I was like hey, I need a job, so I'll give it a shot," Steele says. He says driving a bus can't be that bad. As the job market gets better, some lower-paid positions are going unfilled. 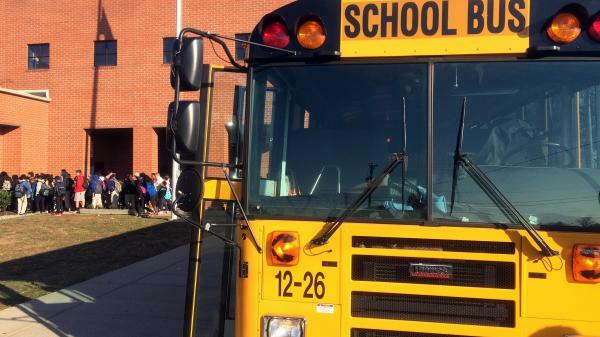 Some school districts from Indiana to Florida can't find enough bus drivers. The problem is so bad in some areas that students have been stranded at bus stops or arrived late to class. Blake Farmer of member station WPLN reports from Nashville, which has one of the worst shortages in the country. BLAKE FARMER, BYLINE: Listen to the radio chatter between bus drivers, and it's clear why being short-staffed is stressful. Everyone is trying to cover for someone. UNIDENTIFIED WOMAN #1: I just finished unloading at Mountain View for my route. You want me to go pick up Lakewalk? UNIDENTIFIED WOMAN #2: Ten-four 'cause I've just got three more stops left. FARMER: In Nashville, there are 550 slots for drivers. Nearly a quarter are unfilled, and that's when no one's sick. SUZANNE ADAMS: (Laughter) Thank you. Have a good day. Thank you, bye-bye. FARMER: Veteran driver Suzanne Adams drops off a load at Overton High School, which, earlier this year, had 10 routes with no dedicated drivers. Every day was a mad scramble. ADAMS: So you should be doing three routes in the morning and three in the afternoon. I was doing six-and-a-half in the morning and six in the afternoon - a lot. FARMER: That doesn't even seem possible. ADAMS: Yeah, it's a lot. You're just running back to back. FARMER: Kids were left waiting for an hour or more and showing up to class after the bell rang. Sophomore Souleen Ramazan, who rides on Adams' bus, says that she understands. SOULEEN RAMAZAN: It is a hard job. You have to wake up extra early in the morning. I mean, it's hard for them, too. FARMER: It's not the odd scheduled. For many, the hard part is the unpaid time off - spring break, fall break, Christmas break, not to mention summer. That requires disciplined budgeting even for someone like Suzanne Adams who's topped out on the hourly pay scale. ADAMS: When the kids are out of school, you know, we don't get paid. That's really hard. And so I do understand, you know, people going somewhere else. TRACY GARTON: I've said, like, every year that I'm going to quit and look for something else. FARMER: Tracy Garton has driven for a decade now, and the kids are not what keep him coming back. In the last week, he's caught one smoking marijuana. Another threw a bottle out the window and busted a windshield. GARTON: You got to sit with the police and go through all that, you know? It's just stressful, you know? I mean, it's not like a regular job where you just, you know, you go into work, go home. FARMER: And there are many other regular jobs out there right now. They can make more driving charter buses or 18-wheelers. And the trucking industry has an even more pressing driver shortage, so sometimes, there's a signing bonus. Like other desperate districts, Nashville's public schools have raised pay and offered bonuses. Administrators admit they fail to keep pace during the economic recovery, especially since bus drivers were some of the budget cuts during the recession. TOM MCMAHON: An ancillary service like transportation can be one of the first places that school districts will look to make cuts. FARMER: Tom McMahon is the editor of a trade publication called School Bus Fleet. He surveys districts every year on staffing levels. There's a direct correlation. When unemployment is high, districts have very little trouble finding drivers. But low unemployment spawns an exodus. MCMAHON: School bus drivers, in many cases, just aren't paid enough for the amount of responsibility they have. FARMER: Nashville's next batch of drivers is training now, learning how to back a 45-foot-long vehicle. The shortage has gotten the attention of some brave job seekers. The school system is paying new drivers like Roman Steele while they study to get their commercial licenses. ROMAN STEELE: Pretty much, I thought it'd be a cool opportunity. I was like, hey, I need a job, so, I mean, I'll give it a shot. FARMER: He says driving a bus can't be that bad. For NPR News, I'm Blake Farmer in Nashville. Transcript provided by NPR, Copyright NPR.